Gaelic choir discovers "Chuckle Muscles" ! 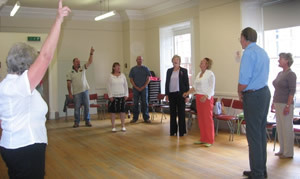 Members of the Aberfeldy & District Gaelic Choir enjoyed an unusual workshop at the weekend with voice coach Val Munro, who encouraged them to learn how to sustain their breath by discovering their “chuckle muscles” below their ribs! Using a variety of exercises and voice-training techniques, Val taught the Choir members how to increase their vocal range, the importance of good posture and how to have what she calls a “happy larynx”! The workshop was held as the Choir is gearing up for October’s National Mod in Dunoon. The Choir will be holding a free pre-Mod concert on Monday 16th October at 8pm in the Aberfeldy New Church Centre in Taybridge Road, to which all are welcome.